Freshman Likud MK will not be allowed to direct Knesset sessions until further notice, but still receives support from Knesset speaker. 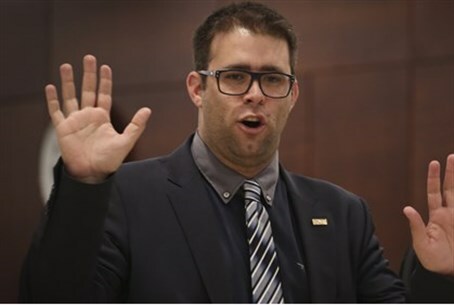 The saga over the alleged past of Deputy Knesset Speaker MK Oren Hazan (Likud) continues Tuesday, after he was summoned to meeting with Knesset Speaker Yuli Edelstein over allegations from Channel 2 that he was involved in providing escorts and drugs to fellow Israelis in Bulgaria. Hazan stated on Twitter Tuesday afternoon that the meeting would end early, because he is meeting with his legal team to discuss a lawsuit against the news agency. During the meeting, Edelstein stated to Hazan that the latter would not be given authority to direct Knesset sessions, given the allegations. However, he also added hopes and wishes for good will for Hazan to win his case. If found to be true, Hazan will still stay in the Knesset, but likely in a diminished role. There is no precedent to dismiss an MK from office unless convicted of a crime involving "moral turpitude" in the final verdict, but he may be suspended as Deputy Knesset Speaker if there is a 61 MK majority vote. Also, Likud may remove him from the committees where he is a member, and especially the Foreign Affairs and Defense Committee.